You can copy and move markers, adjust their lengths, and color them. You can also change the appearance of marker text in the Marker Text window (or area). In the Marker track: Option-drag the marker. You can also copy a marker, move the playhead to the position where you want to paste the copy, and then paste it. In the Marker List: Use the Copy (Command-C) and Paste (Command-V) commands. In the Marker track: Drag the marker left or right to a new position. In the Marker List: Use the pointer as a slider in the Position field, or double-click a position value and enter a new value. In the ruler: Command-drag a marker left or right to a new position. Note: The increments by which markers can be moved in the Marker track depend on the horizontal zoom level of the Tracks area and the Snap pop-up menu setting. Watch the help tag for precise feedback on movements. If you need to adjust markers in finer increments, use the Marker List. There are times when you may want to protect markers from being moved. 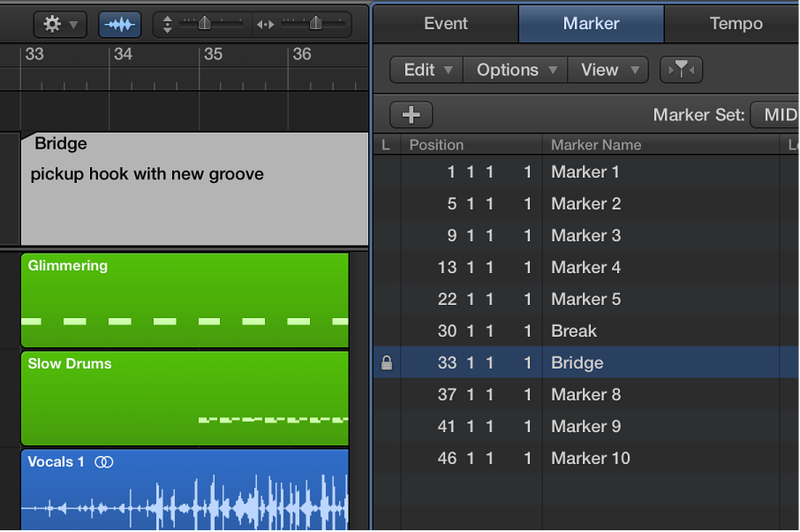 Logic Pro has a feature that preserves the absolute time position of events. Choose Options > Lock SMPTE Position in the Marker List (or use the corresponding key command). This command locks (fixes) the time position of markers, and a lock symbol is displayed at the beginning of the marker name. These markers always retain their absolute time position: if the project tempo is changed, the bar positions will change to keep the markers at the same time positions. Tip: You can also lock and unlock the time positions of markers from the Region menu in the Tracks area, and the Functions menu in the Piano Roll Editor and Step Editor, if you turn on the display of global tracks. Choose Options > Unlock SMPTE Position in the Marker List (or use the corresponding key command). Note: You cannot unlock the time position of scene markers. See Use movie scene markers. In the Marker track: Place the pointer over the left or right edge of the marker. When the pointer changes to a Resize pointer, drag the marker edge to the new position. Markers cannot overlap. The edge of one marker cannot be dragged over another marker. Drag the cycle area onto a marker in the Marker track. Tip: When you hold down Shift after click-holding the cycle, the cycle can be moved horizontally, and then dragged to a marker in one go. When you hold down Shift before clicking the cycle, the nearest cycle border is set to the clicked position. Choose View > Show Colors to open the Color palette. Select the marker in the Marker track, then click a color in the Color palette. When you select a dark color, the marker text is automatically shown in an inverse color. Double-click the marker text you want to change. Click the Font button in either the Marker Text window or the Marker Text area. 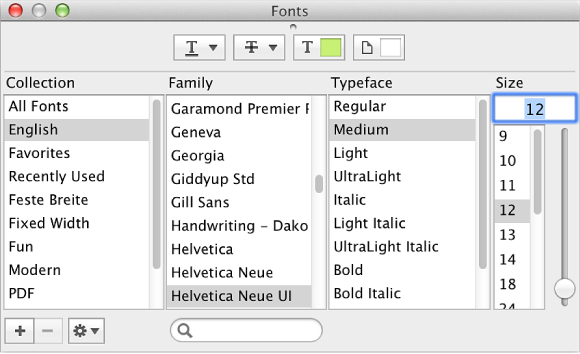 Choose settings in the Font window. The text in the Marker Text window changes to match the settings. The text in the Marker track is not affected.